Horrified by the conditions of prisons and prisoners that her father and older sister had tried to shield her from, Matilda determined to visit the filthy prisons to preach the love of Jesus. After visiting them faithfully for an entire summer during her teens, the family received a letter from a young traveling minister - the one who had led Matilda to Christ during a revival meeting some years before. The only reason for his wishing to visit and become better acquainted with the family was because he was, most likely, interested in a courtship with Matilda. Dreams spun before her eyes as she imagined seeing this young man again; of carrying on the prison ministry together, with a protector by her side. But then, she had a dream. Of a convict by her bed, rattling his horrible chains and pleading for her to tell the prisoners of God's love - while there was still time. The dream seemed to be confirmed with Scriptures she read the next morning, like Ezekiel 3:11 and Jeremiah 1:6, telling her to go, speak to those in captivity, and not worry that she was hardly more than a child. The next morning, as assurance that this was His plan for her life - though one she would have hardly chosen - she canceled the minister's visit, and decided that she would be "wed to the prisons": prison ministry would be her life. For the rest of her life, Matilda traveled to the prisons throughout Finland, seeing God's miracles in even the most hardened of prisoners soften. She endured the atrocious filth and trusted in God's protection when alone with cruel murderers. She began living a humble life of poverty for the prisoner's sake, dressing and eating simply and poorly so that they would not be sidetracked by anything in Matilda, but would only see Jesus. The prisoners began to love her, and she dropped her title of Baroness for good, preferring to be known only as "the prisoner's friend". Occasional visits around the countryside to the home of her former prisoners were good for her, as she saw converted men leading honest lives with their families, forever grateful to a young woman of passion and purpose for showing them the way while there was yet time. Years later, when a new dictator came to power in Russia, and there were wars and Civil Wars, Matilda was not allowed to visit the prisoners. Undaunted, she kept her doors open for all who needed help, and wrote many letters to those in prison all across Finland. She pushed for prison reform, and opened the public eye to what was really going on. 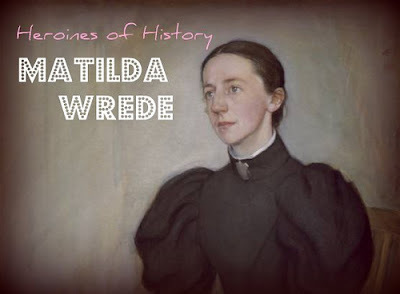 But above all, Matilda Wrede was, simply, "the prisoner's friend." I found this blog while reading the book "Do Hard Things" by Alex and Brett Harris I loved the book and am very excited to start my life of Giving my all to God and doing the maximum amount of effort I can to bring more people to him I hope to go above and beyond the expectations for teenagers today. Please pray that I succeed in this. Poem Girl, I'll definitely be praying for you! Wow! Thank you for re-posting such an inspiring story on the life of a woman fully surrendured to her King. I love hearing about such forerunners in the Faith, particularly ones less known about.